Keep out of reach of children. Not for human consumption. Contact poison control center if ingested. All Brightwell Aquatics liquid water care supplements are made with purified water and high purity materials. Brightwell has developed formulas for aquaria based on empirical data, using observation and measurement rather than theory. 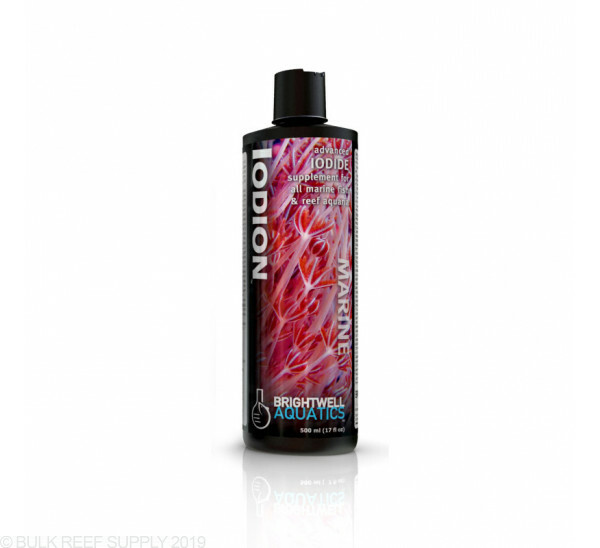 How much will 5 mL of this supplement increase the iodine level in 10 gallons of water? Thank you for reaching out to Bulk Reef Supply! It requires extra precaution when dosing anything into a nano aquarium especially if it is something new to your tank. The recommended dosing for this particular product is 5ml/50 gallons of water so the proper dose for a 10 gallon would be 1ml. Overdosing can be very harmful if not fetal to reef inhabitants. A common rule of thumb when starting to dose something new is to dose half the recommended amount and increase slowly as needed. I hope this was helpful. Please reach back out if you have any further questions!